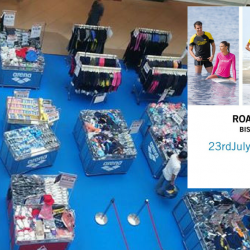 Head on down to Arena's Roadshow from 23-29 July 2018 at Junction 8, Bishan for some quality swimwear, bikinis and other fitness apparel at an insane prices! 23 - 26 Nov 2017 Arena/Le Coq Sportif: Warehouse Sale with Prices Starting from $8! 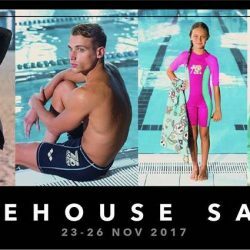 Head on down for Arena & Le Coq Sportif's year end warehouse sale this coming Thursday - Sunday on the 23rd - 27th November for some quality swimwear, bikinis, sneakers, other fitness apparels at an insane price! 24 - 27 Nov 2016 Le Coq Sportif / Arena: 2016 Warehouse Sale with Sports Apparel, Swimwear, Shoes & Accessories from $5 Onwards! Le Coq Sportif / Arena's 2016 Warehouse Sale is back from 24th till 27th November 2016! 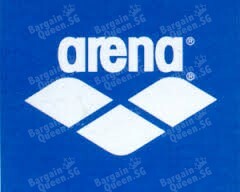 From $5/- onwards, everything must go with huge savings on swimwear and accessories brands such as Arena, View, Sun Seeker and many more. There will also be Le Coq Sportif Apparels, Shoes and Accessories on sale with daily replenishments of stocks! 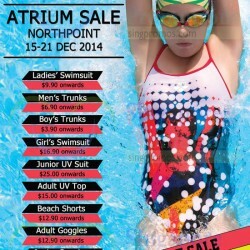 Arena is having Atrium Sale at Northpoint from 15 December to 21 December 2014. Enjoy! 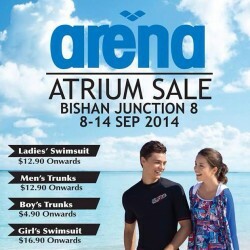 Check out Arena Atrium Sale At Bishan Junction 8! Start from 8 SEP 10:00 AM to 14 SEP 2014.